[Click to engaiaenate, or grab the terrestrialicious 11,500 x 11,500 pixel shot]. Like the other one, this is a mosaic, created over six different orbits — the bright north/south swaths are actually the reflection of the Sun in the ocean as the satellite passed over that area multiple times. Although the satellite is in low Earth orbit, just a few hundred kilometers off the surface, the images have been mosaicked together to represent the view as if you were about 13,000 km (8000 miles) away. You’re seeing most of but not quite all of the entire hemisphere here. The inset image shows why; the farther you are from Earth the more of it you see. If you’re having a hard time picturing that, imagine taking a camera and holding it a couple of centimeters from your floor. You only see a small section of the floor, right? Now take hundreds of pictures, moving the camera each time to get a different part of the floor. If you stitch those pictures together you have a complete image of your floor, even though it was too big to see from any individual shot. It’s as if you were hovering over the floor from higher up and took one shot. 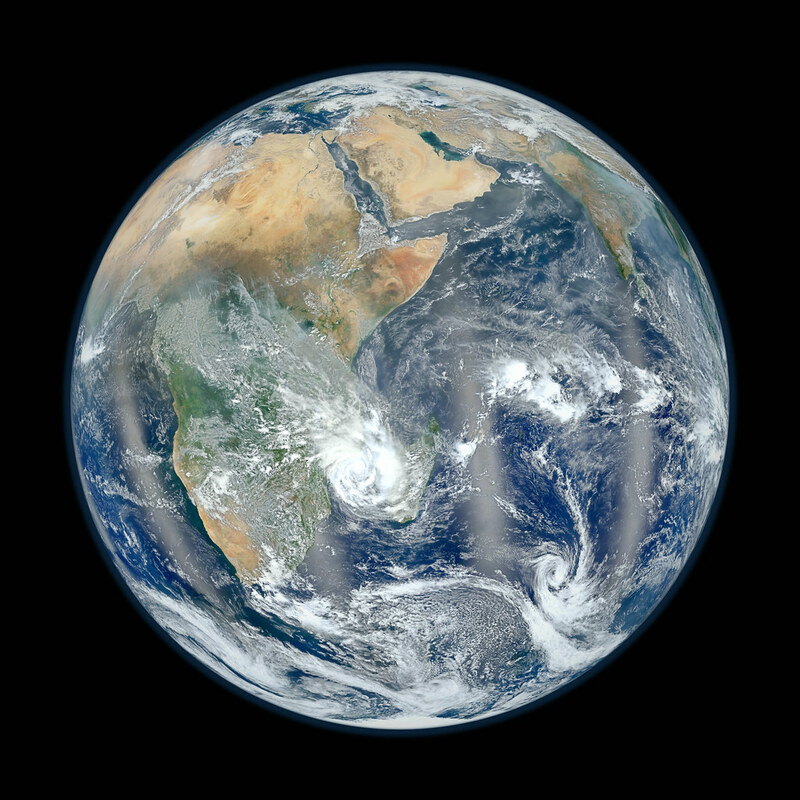 That’s how this was done as well, though the pictures couldn’t just be stitched together; they had to be warped a bit to account for the Earth being round (near the Earth’s limb you’re seeing the ground at more of an angle than what’s directly below you). That’s why the image gives you such an overwhelming feeling of perspective, of actually being over the planet from all those thousands of kilometers away. And I wonder… someday, our children may get this view every day, just by looking out a window. Every time I think about that, I get a chill. When I was a kid, that thought was science fiction. Now it’s maybe just a few more years down the road.